Wood pellet grilling is a popular way to prepare meats, and products such as the Traeger Lil Tex Elite 22 Pellet Grill provide users with a great cookout experience. This article will review this particular model and discuss the many features that it offers any backyard chef, no matter their experience level. An overview will cover the general uses for this grill as well as who may benefit from it. That will be followed by a list of specifications as well as a discussion of features and a list of pros and cons. The article will finish out with a look at some concerns brought up in other reviews and ideas that may help to address them. This pellet grill is fed by a medium-sized hopper that can hold up to 18 pounds of wood pellets. It is powered through a standard household outlet and produces 20,000 BTUs at a time. The digital controller displays in bright orange lettering that is visible both during daylight and at night. This control system adjusts the speed of the automatic auger which maintains the temperature within 20 degrees. The 22 x 19-inch grate provides room for 16 burgers. What you get with this grill is plenty of cooking surface for gatherings with family and friends. Novices will find the digital controls easy to use and read, while advanced grillers will appreciate the ability of a six-in-one cooking system. This unit uses an autostart ignition and auger feed which allow this grill to operate on its own. The Traeger Lil Tex Elite 22 Pellet Grill is a good option for most backyard events. It comes with elite digital control: The digital display on the control panel shows in orange lettering that is visible even in sunlight. This controller monitors the internal temperature of the grill and keeps the temperature within 20 degrees of the desired level. The way this actually works is through taking control over the automatic auger. The grill is easy to clean: This grill uses a steel grate that is coated with porcelain, which makes clean-up easy and quick. It also includes the EZ-drain grease system. This system pulls grease away from the grate and allows it to be collected for fast removal. It provides multiple cooking options: The settings can be used to set and forget, which frees up a user to do other things. Furthermore, its body shape and vent system provide proper convection cooking. This allows heating across all surfaces without needing to flip meats. There are settings for baking, grilling, and smoking. The Traeger Lil Tex Elite 22 Pellet Grill can also braise, barbecue, and roast. Trager is a well-known brand with good customer support: The Traeger Lil Tex Elite 22 Pellet Grill comes with a three-year warranty. Traeger also offers customer service online as well as shops across the United States. They also offer classes on grilling and grill uses. Concerns about newer grills: The Traeger Lil Tex Elite 22 Pellet Grill is built with 20-gauge steel. These components are lighter and thinner than previous generations of Trager grills. While these materials appear more flimsy than the older steel used previously, its use provides similar integrity at a lighter weight and lower price point. Overseas construction may not fall under the same scrutiny as it would in the U.S., however. A digital elite control system is easy to read and use. This gill uses an advanced grease management system. It provides a six-in-one cooking capacity: grilling, smoking, barbecuing, roasting, baking, and braising. Traeger offers a three-year warranty for this model. The Traeger pellets work best but are more expensive. Its burner rod does not last as long as those on other grills. This grill is made from less durable metals than previous generations. The Traeger Lil Tex Elite 22 Pellet Grill is built overseas, and some customers feel that a lower quality control produces parts that are less durable. These reviews are countered by many customers who report no issues with components. 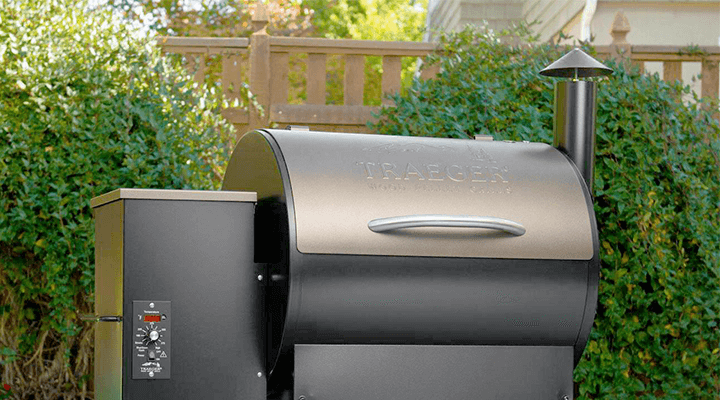 Traeger stands behind their grills and offers a lengthy warranty for each. The company has multiple stores and outlets across the United States that can provide fast customer service and replacement parts. One theme that was touched on by a few customers was inaccurate temperature readings. Most pellet grills state that they keep temperatures within a 20 degree Fahrenheit window. The Traeger Lil Tex Elite 22 Pellet Grill falls within this category. On the other hand, a majority of customers express complete satisfaction with the temperature controls. The Traeger Lil Tex Elite 22 Pellet Grill offers users the ability to serve backyard gatherings with a variety of cooking options. Its easy controls and clean up will appeal to beginners and advanced users alike. We’d love to hear about your experiences and suggestions with this wood pellet grill! Visually this thing just looks nice! I’m beginning to really like the incorporation of digital controls, which this grill has. Multiple cooking options are nice too. I’m a bit worried people are skeptical about the quality. Hey, Anas, there will always different user views on one product. However, one thing is for certain: Traeger is one of the few established brands in the grilling market. If this grill caught your attention, go for it! Also, we love seeing technology incorporated in traditional grills too. Controls are making our life so much easier!